Whisk together the lemon juice, 1 tablespoon olive oil, oregano, and salt and pepper in a small bowl. Combine lemon juice mixture with chicken in zip-top style plastic freezer bag. Place in refrigerator for at least an hour, preferably 3 to 4 hours. Drain off any excess marinade from chicken and discard. Heat an ovenproof skillet or grill pan over medium-high heat. Add remaining 1 teaspoon olive oil. Add chicken to skillet and brown on both sides. Place chicken in oven and cook for about 10 minutes or until cooked through. Let cool slightly, then slice. Partially peel the cucumber in alternating strips. Slice cucumber in half lengthwise, then cut into ½-inch half-moon shapes. Place lettuce, cucumber, tomato, and onion into a large bowl. Toss with Greek Vinaigrette. 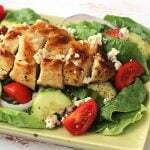 Divide lettuce mixture between two serving plates and top with feta cheese and chicken. After marinating the chicken, you could also cook it on the grill.